I have to say that it's difficult to side with either party in the Outsider Test debate going on here. On the one hand, I understand the presuppositionalists' refusal to take part. They firmly believe that Christianity is the truth, that their god created this world and is the king over all of it. It would almost be an act of unfaithfulness to deny their god's sovereignty and adopt a perspective that assumes the very opposite of their faith. The Outsider Test asks them to act as if their god does not exist, something that they see as unfaithful. At the same time, though, I'm with John on this one. From the atheist's perspective, it seems too coincidental that religions just happen to dominate certain geographic locations and culture. Now, from an atheist's perspective, it certainly seems reasonable to assume that, generally speaking, people adopt a religion because it is part of the culture of the geographic region they are from. In India, most people are Hindu. In the Middle East, most people are Muslim (though, some of the Christians here have made a good point that this is a state-imposed religion in much of the Middle East; I still think that it might be a stretch to assume that most Muslims in the Middle east only believe from coercion). In South America, most people are Roman Catholic. In the US, there is a close split between Roman Catholics and Protestants, but even these are geographically located. I think that Christians, here, might even agree with this partially except in regards to their own Christianity. It doesn't seem unreasonable for a Christian to also assume that a person is Hindu because they grew up in a country of Hindus. I'm sure the reformed among us would say that these people have rejected the Christian god because they love their sin and that they have adopted a religion only to justify their rebellion, but it still seems reasonable to conclude that they adopted that particular religion because it was the popular religion of that geographic location. I know that most Christians, here, believe atheism is a religion and we hold it like any other religious person holds their faith. I know that the Christians, here, believe that we are only atheists because we love our sin and we want to deny the Christian god's sovereignty over us. But I have to say, as honestly as I can, that it doesn't feel that way to me. I feel that I am "unaffiliated" when it comes to religion. I feel that I am not a Christian because there is simply no good reason to believe and a lot of reasons not to believe. My moral life since leaving my faith is virtually unchanged. I have been faithful to my wife. I have a job that most people would not work that allows me to help poor, racial minorities in an infamously difficult inner-city setting. I have very close friends (all of whom are Christians, by the way--three career missionaries, two seminary students, one seminary graduate (i.e. aside from the career missionaries who are also seminary graduates)), a good family (who are also all Christian), etc. My point is that it feels to me that, because I am unaffiliated, I am being "courted" by the various religions. The Muslims are recommending Islam, the Hindus are pushing Hinduism, the Christians are offering Christianity (in all of its various forms). . . Each of these groups say that theirs is the only "true" religion. I look at the map above, though, and I wonder if that same person would be arguing for a different religion if they had been born in a different place in the world. In other words, it is hard not to dismiss a religious person's claim that their religion is the truth when it certainly seems, from my point of view, that that same person would be pushing another religion had they been born in a different part of the world. In my post on presuppositionalism, I discussed relative, but objective, judgments regarding motion. I said that contradictory statements about motion can both be true given certain spatio-temporal frameworks. I can both say that my Guinness is moving and that my Guinness is not moving understanding that one statement belongs to one spatio-temporal framework and the other belongs to another one. I imagined that no one would really disagree with this, that it is easy to see the truth of a statement from a particular framework. So, I'm willing to admit that, from the perspective of the Christian, the Outsider Test is an unacceptable act of unfaithfulness to their god. It asks them to reject the one they feel is the rightful ruler of the universe. I understand that (though, I would argue that if your god is truly a god, then he should probably be able to hold up under critical examination). But can the Christians, here, not also admit that, from our point of view, it is certainly suspicious that world religions dominate geographically and that it is not unreasonable for us to conclude that religions are products of culture and geography, not products of "truth" and "falsehood"? "though, I would argue that if your god is truly a god, then he should probably be able to hold up under critical examination"
EXACTLY. I conducted my own Outsider Test during my deconversion, and my argument to myself was this: if the Christian god is the Truth, then that Truth will be apparent to me whether I presuppose His existence or not. After all, I can presuppose that my stove isn't turned on, but I'll still get burned if I touch it. "But can the Christians, here, not also admit that, from our point of view, it is certainly suspicious that world religions dominate geographically and that it is not unreasonable for us to conclude that religions are products of culture and geography, not products of "truth" and "falsehood"?" How then do you account for those who are born in these geographical areas who reject whatever religion is dominate in the area? Further how do you account for conversions? For example if missionary x goes to area y and offers his religion (which according to the post may or may not offer a truth claim) and someone converts, why would they do this? You may be able to look at the map now and say "well here are the areas where x religion dominates" but you are looking at a modern map, certainly you can say that now but what about prior to the missionary work? Some factor has to account for the conversion of pagan nations to another "religion". Isn't it equally plausible that the initial converts were won over by the truth claims of the religion? Zach showing is naive view again. Empirical evidence need not ever refute a basic belief, and there is no telling which belief on will give up in the face of conflicting evidence. Also, presuppositions determine what you take as your theory of truth. So, all your stove story did was show that you exault tactile sense as an ultimate authority. But, what if you *truly* presupposed that tactile sense was always faulty? Or, what if you presupposed that you had no body and all of this was a dream? Then you realy wouldn't be getting burnt. So, all you've done is show that you presupposed another set of presuppositions instead of the Christian ones you said you held. So, you were unfaithful to the faith, and then concluded that the faith was wrong! Well, with that starting point, who wouldn't be an atheist? Streetapologist, you are asking us to explain the exceptions, and we are asking you to explain the rule. If a very strong case can be made on behalf of the Dependency Thesis supporting relativism (mentioned earlier), then this religious geographical proliferation is exactly what we would expect to find in the world. The exceptions are simply that there are people who think for themselves and in so doing own a particular religious commitment, rather than adopt what was taught to them. There are several social reasons for leaving the faith that a person was born into, though. If a person had some bad experiences at the hands of someone who taught him what to believe, this person may leave that faith for another(victims of Catholic molester-priests, for instance, or abusive fathers, or uncles). If the person thinks through what his faith claims and just cannot reconcile his faith with what he learns or experiences though life, then he may leave his adopted faith too. With the advent of modern science there are more and more atheists (why do you suppose that is true?). But when such a person does decide to leave his or her faith, and chooses another one, many times that different faith (or sect) will be one that he was already exposed to. But atheism and agnosticism can be chosen by a former believer without ever having been exposed to it, since it's simply the denial of one more god than what everyone else adheres to. Now, how do YOU explain the rule? Where are there pockets of atheists as a dominating social force around the globe? It's the social forces themselves which have the very strong tendency to cause people born into that society to adopt those belief systems. Atheism is a denial of just one more religious system than what they all deny, and there is a great deal of pressure not to be an atheist. The outsider test merely asks people to be skeptical of their religious faith. Am I skeptical of atheism? That's hard to say. I know there are things about it that I cannot quite defend, yet. But I do think it wins hands down in the marketplace of ideas. I adopted it against everything I thought I knew, even with the presumption that Christianity was true. That's all I can say. If I'm wrong then I'm wrong. But I did the best I could do. Your religion (and the Muslim one) claims that if I get it wrong I'm going to hell. I doubt very much that an all-knowing and all caring God would so judge me for getting this wrong, even if atheism is based upon my social conditioning. Besides, atheism is a skeptical metaphysical system by its very nature. This is all that the Outsider Test asks us to consider, given the facts of the Dependency Thesis and the geographical location of religions around the globe. But with so many religions proclaiming the truth and some still willing to kill those who disagree with them (even though they were probably all propogated by the sword at some point) I'd much prefer to accept no religion at all. Besides, someone could still accept the outsider test and not be a moral or religious relativist. In fact, a person can deny relativism and still claim that she doesn’t know anything else that is true except that relativism is false. Another person could simply say that religious and moral relativism are false in the end, but she could also believe that to rise above the circumstances of our times is extremely difficult and that only a few people in every generation can do it. This may actually be the case, even granting that there is objective truth. Then what becomes of the Christian claims to truth in a world overwhelmingly dominated by religious beliefs, which are almost, but not completely dependent on the “accidents of history” (where are when we were born)? Of course, if there is no empirical test to decide between religious systems of beliefs, then what we find around the globe is exactly what we should find. Again, we are asked to explain why there are exceptions, if there are any. But you are being asked to explain why there is the rule, that is, why do religious beliefs dominate in specific geographical areas? Why is that? "But, what if you *truly* presupposed that tactile sense was always faulty? Or, what if you presupposed that you had no body and all of this was a dream? Then you realy wouldn't be getting burnt." That's another possibility. But the only presupposition that I can't abandon is that I exist. Cogito ergo sum, right? So let's say that I abandoned empirical evidence and walked into a burning house. I could ignore the pain as counter to my presupposition, but I could ignore the ending of my existence. Admittedly, that's a high price to pay to show a necessary presupposition, and I don't think I need to pay it. But my existence isn't likewise threatened if I abandon supernatural presuppositions, which I have. Living in Canada I think the map should be changed to "mostly apathetic". "Where are there pockets of atheists as a dominating social force around the globe?" How about San Francisco? Manhattan? D.C.? Beijing? Moscow? NYT? CBS? Princeton Theological Seminary? Every major university in the Western World? John, I don't really know what you are trying to establish here or how this in any way "debunks" Christianity. So what if people tend to believe what they were taught and what their society and culture believes? What does that matter, one way or the other, as to the truth or falsity of Christianity? The atheist can use the above chart to confirm what they have suspected all along: that they, as bold evidential atheists, are really the smartest of the bunch in that they don't follow the little lemmings. On the other hand the Christian sees your post as confirmation of the doctrines in Romans 1, namely, that everyone has a sensus divinitatis (a sense of the divine), but that this gets all muddled and confused because most people, at their core, don't really want God, himself....they just want a religion they can manage themselves that can provide stability and establish a social power structure. That is how a Christian would explain the "rule" as you have defined it. Which also explains the abuses of religions and Christianity that have been rampant through history even down to the current day. I'm not sure the above chart of religions threatens or confirms Christian truth at all. It is very neutral. 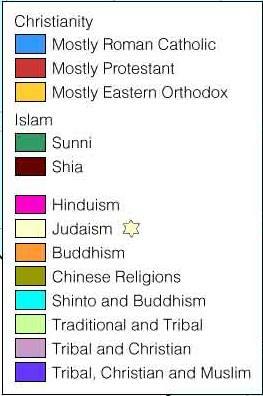 The accidental geography of religious affiliation was one of the main things that stopped me ever accepting any religion. It makes the arguments for joining one or another dissolve into little other than a form of tribalism. The test is one I apply to anyone who tries to convince me I should surrender myself to their particular sect, but I see it as more a way of discerning a religious person's depth of orthodoxy or fundamentalism than a test of the veracity of the religion itself. In any faith group, you will find people (among Christians, except in America and the Vatican, probably a majority) who are prepared to say that "so long as you are a good person and act with conscience and empathy, your soul will be fine when it comes to any ultimate judgement". Such people are genuinely prepared to accept that others are entitled to take a different perspective on spiritual matters, within a broad band of moral behaviour, and that no-one should be considered 'damned' because of forces beyond their control, including their place of birth and upbringing. Anything else is separatist fantasy, or all their Gods are no better than mafia bosses. If all truth is relative, and this is absolutely true, then all truth is not relative and this is absolutely false :). i wish everyone to be on the rigt path. and if people find out that jesus was not a god they are simply did not listen to his message or the prophets before jesus. heh, I have to agree with the basic argument here saying that most people believe a set religion based on where they were born, simply because most religion is taught as a presupposition. Now as a former Christian I can say that I am not some person who desires to rebel against God, I honestly believe he doesn't exist. I say "athiest" loosely because I am undecided whether I am atheist or agnostic. One about this not debunking christianity - This is not a post to debunk christianity. This is to support the premise of examining your beliefs with no presuppositions. The fact that what religion a people are is largely based on geography definitely shows that religion is based more on culture then on the divine. It's about the bell curve. You don't need 100% to fit the type. The truth is that if you were born in India you have an extremely high probability of being a Hindu. That doesn't mean a 100% probability. But if youre born in the US, if I were placing bets in Vegas I'd bet on you being a Christian. People can be converted fora many reasons, buy people are much much more likely to believe the religion they are born into.